I wrote about Chief Keef for Gawker a week or so ago; my initial draft had been considerably longer than space would allow — this was a very rich story, with a lot of different angles that I wish I could have gone into in more detail. There were definitely some ideas and quotes that I thought readers might find interesting, as well. I’ll be answering some questions that piled up on the somanyshrimp tumblr after I publish this, so if you are curious about this story, feel free to ask through tumblr. King Louie’s rise coincided with the arrival of Duan Gaines, a hip-hop producer and pioneering street cinematographer who goes by the name DGainz. “I was working with my little cousin, producing and writing for him. The songs were nice songs, everybody liked them. I said, we need some visuals to them. So I bought a camera and it came natural.” DGainz is a humble 23-year-old, untrained in cinematography. He’s also the driving force behind Chicago’s underground street-rap scene as it’s made its way to the Internet for the very first time. His success was rapid and influential, and much of it occurred in the past year. DGainz received a big boost when he was contacted by Louie this past summer. Louie had become the South Side’s biggest local star. Once DGainz dropped a dark, cinematic visual for Louie’s “Gumbo Mobsters,” the floodgates opened, and artists from across the city wanted a DGainz video. 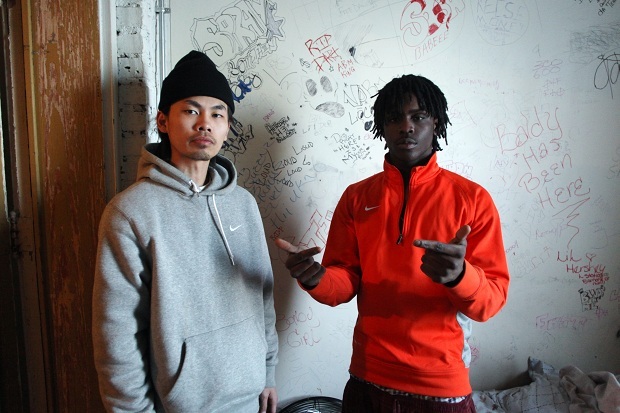 One of these artists was Chief Keef, who contacted DGainz directly through facebook. They met at A.O.N. studios, which was located in an apartment and run by DJ Kenn. The video to “Bang” was shot in 30 minutes in the backyard of the studio. “I just wanted to give it the look that it sounded [like]. It had a grimy sound to it,” said Gaines. By the time Keef’s Bang mixtape was released in early October, the video for the title track had 70,000 views. By New Years Eve, that number would surpass 400,000, largely, according to YouTube statistics, through mobile views; kids were watching the videos on their phones. It had become the runaway hit of DGainz already-impressive videography. “See, motherfuckers think I can’t do metaphors and ain’t about metaphors and punchlines. They–” he gestured at a fanbase, outside the apartment, “don’t want to see me do that. I don’t sit down and ‘think,’ I write about what’s going on right now, what we just did, what just happened. That’s what I write about. I don’t be trying so hard. I used to, ask him–” he points at DJ Kenn. “He told me to stop! Kenn was the reason. He said, ‘stop saying so much.’ That’s why I got comfortable and started–” he’s interrupted suddenly by someone knocking at his door; he signals them through the window, banging a vase against it to get their attention. Since his sudden national breakthrough, Keef’s found some allies in unexpected quarters. In addition to avant-weirdo Lil B’s appearance on the “Bang” remix, critically-acclaimed rapper Danny Brown showed some enthusiasm for Keef recently on Twitter. But Keef’s hip-hop aspirations are well within hip-hop’s mainstream. “Gucci, Soulja, Future, Tity Boi, Young Jeezy, Yo Gotti. That’s about it,” he says about his favorite artists, before adding that in Chicago, all he sees is King Louie and his friends from the neighborhood. Later on, he raps the hook to Fat Trel’s “Respect with the Tec,” a song from another young, rising artist. Trel became a breakout street rapper last year, in part thanks to his own singular visual presence on YouTube. This entry was posted in Uncategorized and tagged chief keef. Bookmark the permalink.